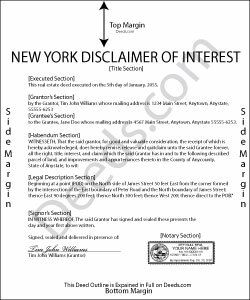 A beneficiary of an interest in property in New York can disclaim a bequeathed asset or power (New York State Code, Estates, Powers, and Trusts, Article 2, 1.11). Such a renunciation, which must be in writing and signed by the beneficiary or a legally authorized representative, allows that beneficiary to disclaim his or her interest in the property, either in full or partially (1.11 (c) (1), 1.11 (f)). The renunciation is only valid if the beneficiary has not indicated acceptance of the property, for example, through transfer or encumbrance, acceptance of any payment, or other actions (1.11 (g)). It must be acknowledged by a notary and accompanied by an affidavit stating that the beneficiary is not receiving monetary consideration in exchange for the renunciation (1.11 (c) (2)). The statutes provide a nine-month window, to be extended at the discretion of the court, during which the beneficiary must file the renunciation document with the surrogate court in the county where the will or estate is being administered. The document must also be delivered to the fiduciary or administrator of the estate, or to the person holding legal title to the property (1.11 (c) (2)). A renunciation is irrevocable (1.11 (h)) and has the same effect as though the beneficiary "had predeceased the creator or the decedent" (1.11 (e)). So, consult an attorney when in doubt about the drawbacks and benefits of renouncing inherited property. David K. said: Excellent instructions to guide one through the warranty deed. Evelia G. said: I love this guide. Thank you for having this available. Reply from Staff: Thanks so much for your feedback Evelia, have a fantastic day! Reply from Staff: Thank you Shelley. Have a fantastic day!